Dr. Côté is an Associate Professor in the Department of Pathology and Laboratory Medicine at the University of British Columbia. She is also an Associate member of the Women’s Health Research Institute, an Investigator of the UBC Centre for Blood Research, and serves on the CANFAR Scientific Advisory Committee. She grew up in Quebec City, did her BSc at Laval University, and her PhD at the University of British Columbia, both in Biochemistry. She did her post-doctoral training at the University of Washington before returning to the BC Centre for Excellence in HIV/AIDS where she started working on HIV and antiretroviral drug toxicity. She then joined the Department of Pathology and Laboratory Medicine, supported by a Michael Smith Foundation for Health Research Scholar Award, and moved to the UBC campus where she has pursued her research program on mitochondrial and telomere toxicity and accelerated aging in persons living with HIV or uninfected but exposed to antiretroviral agents. 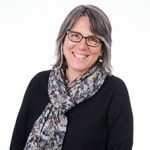 She has been the lead Principal Investigator on two CIHR team grant on HIV Therapy and Aging (2007-12), and Cellular Aging and HIV comorbidities in Women and Children (2013-18) and leads the pan-Canadian CARMA cohort. My research concentrates on the mitochondrial toxicity of drugs, primarily antiretroviral drugs used in HIV therapy. The use of highly active antiretroviral therapy (HAART) (triple therapy) has significantly decreased mortality in the HIV infected population. However, HIV therapy is not a cure and treatment is life-long. As HIV infected individuals survive longer, the toxicity of the drugs and the serious side effects they cause are becoming a significant cause of morbidity and mortality, not to mention a cause of non-adherence to prescribed therapy.The drugs can cause mitochondrial DNA (mtDNA) depletion through inhibition of the mtDNA replication by the mitochondrial polymerase gamma, as well as mtDNA damage through mutation/deletion. Recently, drug-induced changes in mitochondrial gene expression have also been observed. All these can lead to mitochondrial dysfunction in various tissues and a myriad of toxicity symptoms including lipoatrophy, peripheral neuropathy, hyperlactatemia/lactic acidosis, liver failure, renal failure, pancreatitis, wasting, fatigue, some of which can be fatal.Some antiretroviral drugs can also inhibit telomerase, the enzyme complex that elongates telomeric DNA. The effect of antiretroviral drug exposure during early fetal development, childhood and adulthood on telomere length is also a topic of interest in my lab. Antiretroviral mitochondrial toxicity and telomere attrition in infants born to HIV-infected mothers. Antiretroviral mitochondrial toxicity and telomere attrition in HIV-infected adults and children, as well as during pregnancy.These two projects study the toxicity of the drug in pregnant HIV infected women and their infants, two populations who are particularly vulnerable to drug-related toxicity. The longitudinal effect of HIV therapy on mtDNA quantity and telomere length in mother and child and the potential effect on mtDNA quality in the children are being investigated. Mitochondrial toxicity in HIV/hepatitis C virus co-infection antiviral therapy. The HIV/HCV coinfected population is also at higher risk of drug-related adverse events as liver damage cause by both viruses and the drugs add up. We are studying the effect of antiviral drugs on the liver mitochondria in patients undergoing HCV therapy, as well as the effect of therapy on drug metabolism by the liver.